Irvingia gabonensis is a tree that grows in Africa, west and central in particular. It is popularly known in Africa as bush mango, dika, wild mango or ogbono. The seeds of this tree are widely eaten across Nigeria and Cameroon and it is popularly called "ogbono" in these countries. It grows extensively in south-western Nigeria and Southern Cameroon without being necessary planted. A study conducted showed that the seeds of Irvingia gabonensis (ogbono) can induce weight loss when consumed (1). In this same study, the systolic blood pressure significantly reduced among those who consumed Irvingia gabonensis. Consuming Irvingia gabonensis was also shown to reduce blood sugar levels in this(1). This is because the soluble fibers found in Irvingia gabonensis act as bulk forming laxative. Furthermore, the seeds were found were found to delay stomach emptying. This leads to a slow and gradual absorption of dietary sugar which reduces the elevated blood sugars especially after a meal (2). 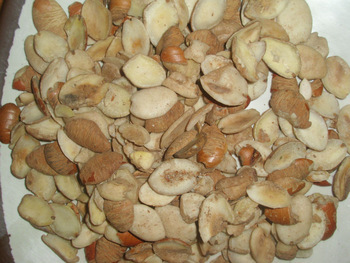 Consuming the seeds of Irvingia gabonensis also helps in improving our cholesterol levels, as revealed by one study. It reduces the bad cholesterol levels(low density lipoprotein) and significantly increased our good cholesterol (high density lipoprotein) levels.